Now there is a real LEGO kit that makes you assemble the Tardis and yes it is bigger on the inside. The Tardis itself is regular size but inside you find the control room witch of course is bigger then the Tardis that is connected to it. So you can play back your favourite Doctor Who adventures. LEGO set 21304 also includes 2 Daleks, 1 Weeping Angel and Clara Oswald and the 11th and 12th Doctor. 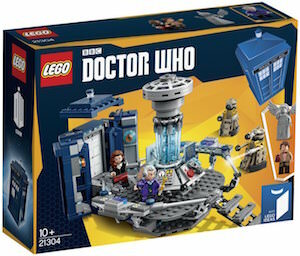 It’s to much fun not to want this LEGO set and yes it does make for the perfect present for a true Doctor Who fan or just someone that likes LEGO. If you always wanted your own K-9 robot dog just like Doctor Who. This is a pretty small robot dog as it is made from LEGO, and no you can’t buy this Doctor Who K-9 dog in store so make sure to order it here or build one yourself. This little robot dog love to play with all your other Doctor Who toys and gadgets and if you are lucky he will even fetch a stick or a sonic screwdriver. 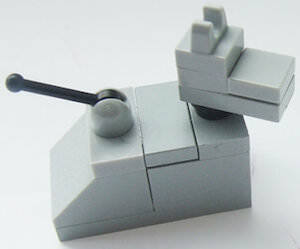 A K-9 robot dog like this is perfect for your LEGO collection. 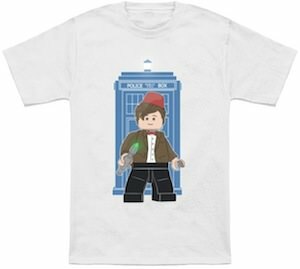 If you like LEGO and Doctor Who then this is the t-shirt for you. This white t-shirt comes in a men and women’s version in sizes starting at Small going all the way to 2XL. And on the white t-shirt you can see the blue Police Box from Doctor Who in the background. And in front of the Tardis there you find the 11th Doctor complete with bow tie, fez and Sonic Screwdriver. But it’s not the real Doctor it’s a LEGO mini figure of the Doctor. This Doctor Who t-shirt is so cute that I just wished they also had a kids version as kids and adults will love this design. 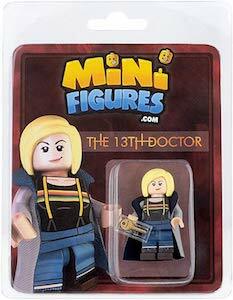 Come and have a much closer look at this Doctor Who 11th Doctor Lego Figure T-Shirt.